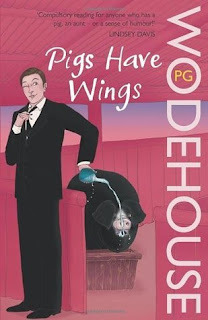 Pigs have Wings is the eighth book in PG Wodehouse's Blandings Castle series. I have never read Wodehouse in the past and I used to cold shoulder all suggestions saying humour doesn't humour me. However, I thought it was about time that I try something and then judge the genre and I finally heeded to a suggestion and chose Pigs have Wings considering how, similar to Lord Emsworth in the book, I have a liking towards pigs too and I chose it purely for the title. The book is about a duel between the Empress of Blandings and the Queen of Matchingham and notwithstanding the fancy titles, these are two oversized pigs. The former, belonging to Lord Emsworth has won the Fat Pigs contest twice, in the past and Emsworth's brother, Galahad and his butler Beach, place their bets on the Empress winning it for the third time in a row. However, Sir Gregory Parsloe, brings in a pig from Kent and Galahad feels threatened and thus, plans devious plots to ensure that the Empress wins it yet again. Added to that, there are also certain romantic sub-plots involving people at the Blandings Castle and Matchingham House. The premise of the plot certainly did seem interesting and a lot of scope for humour was available but then, I felt that the author ended up writing a book where the majority of the book was the romantic sub-plots and tries to create something in the name of comedy weaving a tangled web around them, attempting a romantic blunder. For starters, I felt that there were a way too many characters introduced within the first twenty pages that I found it difficult to follow and took me a while to realise that it was Galahad and not Clarence (Lord Emsworth), who was the lead character. I felt that while the story could have been narrated well, considering the publisher's write up does provide a reasonable scope for a good story but then, the author has it completely messed up with the absolutely below average narration and no noteworthy writing. I have read certain books which, despite not having a great plot, I end up enjoying for the sheer way in which it was presented by the author but this book neither had the story nor did it have the panache in terms of narration. Moreover, I found that the characters in this book were a way too simple with absolutely no depth and the only reasonably built character was Galahad but frankly, with all his tirade against Parsloe, he himself didn't behave in a very honourable way for the reader to actually get behind Galahad. I understand that usually, it is considered sacrilege to not like Wodehouse, let alone criticise, perhaps I had the wrong expectations expecting a meaningful plot (not even deep, merely meaningful) with some content or some excellent writing but then, I can't bend my expectations for the sake of giving positive reviews for the sake of the author who wrote it; for a book that I would have otherwise not liked. All that aside, I feel happy that I decided to read a Wodehouse book, it does increase the diversity of genres that I have read (not necessarily liked) and yes, in case I wish to criticise Wodehouse in the future, it gives my criticism some amount of credibility considering how I genuinely tried a book with an open mind and didn't like it. I give this book a rating of three on ten.